Now in its 35th year, the Colorado Concours d’Elegance & Exotic Car Show will be showcasing nearly 500 rare and exotic sports cars. Bring the kids as this day is filled with activities for the entire family! Mark your calendars now for a car event that has established itself as the premier auto show in its class. The Colorado Concours is a key fundraiser for Ability Connection Colorado’s Creative Options for Early Education Centers. Funds raised help four metro area centers provide early care, intervention, prevention, and support and education services to expectant mothers and to 646 infants, toddlers and pre-school children and their families annually with a wide variety of abilities. Last year, more than 46,000 Coloradoans were served. 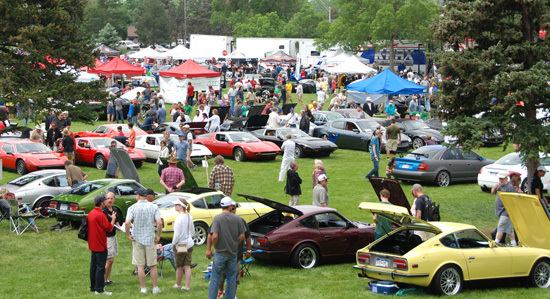 The Colorado Concours is hosted by: Alfa Club of the Rockies; Audi Club of North America-Rocky Mountain Chapter; Ferrari Club of America, Rocky Mountain Region; Looking Glass Corvette Association; Mercedes-Benz Club of America Mile-High Section; Lotus Colorado; NSX Club of America-Southwest Region; Rocky Mountain 356 Porsche Club; Rocky Mountain Chapter-BMW Car Club of America; Rocky Mountain Jaguar Club; Rocky Mountain Saab Club of Colorado; Shelby American Automobile Club; Shelby American Collection, and the Z Car Club of Colorado.